St. Gianna Beretta Molla was born to Albert and Maria Beretta Oct. 4, 1922, the 10th of 13 children. The Beretta family was very devout. Both parents and children attended Mass very early each morning, and each evening recited the rosary, then renewed their consecration to the Sacred Heart of Jesus. * To do all things for the Lord…. To serve God, I will not go to the movies without being sure that the film is suitable and not scandalous or immoral. * I prefer to die rather than commit a mortal sin. * To say the “Hail Mary” every day so that the Lord might give me a holy death. * I wish to fear mortal sin as if it were a serpent, and I repeat I would rather die 1,000 times than offend the Lord. * I beg the Lord to help me understand His great mercy. * The way of humiliation is the shortest way to reach holiness. I pray that the Lord lead me to paradise. * Morning and evening prayers, not in bed but on your knees. * Meditation, at least 10 minutes. * Visit to the Blessed Sacrament. 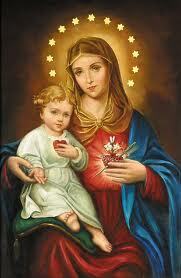 * Holy Rosary: without Our Lady’s help, no one enters paradise. As a doctor, Gianna specialized in pediatrics. She had continual contact with mothers through their children. She became very close to many of these women and helped them through some very difficult times. She would have long discussions with them about the best way to raise children and about the value of human life. Gianna gave birth to three children: in 1956, 1957, and 1959. To thank God after the birth of each child, she took money from her savings to give to the missions, an amount equal to six months of a worker’s salary. Gianna refused a complete hysterectomy, which would have result in the death of the preborn baby. On April 21, 1962, Gianna’s fourth child, Gianna Emanuela, was successfully delivered by Caesarean section. However Gianna continued to have severe pain, and died of septic peritonitis on April 28. This entry was posted in Saints & Blessed on October 11, 2013 by fatheranthonyho. Blessed Laura Vicu¤a was born in Santiago, Chile, in 1891. Her father died when she was only 2. Laura’s mother, Mercedes Pino, was anxious to support herself and her two daughters. After working as a cook for several years in the Quilquihu‚ Hostel, the owner, Manuel Mora, promised Mercedes that if she came to live with him as his mistress he would send Laura to a boarding school. Laura went to a boarding school ran by the Daughters of Mary Help of Christians (the Salesian Sisters). She was very happy living under the care of the young missionary sisters. Even at a young age, Laura was mature enough to understand her mother’s problems. Though not married, Manuel and Mercedes were living together like a married couple. Laura knew that it was a sin. Mercedes had been distanced from God because of Manuel. This motivated Laura to pray every day for her mother’s salvation, and to help her to leave Manuel. “I wish Mamma would know you better and be happy,” she often prayed before the tabernacle. Laura spent most of her time praying, and some of her classmates shunned her piety. However Laura had one good friend, Mercedes Vera, to whom she expressed her deepest feelings, such as her desire to become a nun. Inspired by the Salesian Sisters, Laura hoped to consecrate herself to God in the service of her brothers and sisters. As Laura grew older, Manuel turned his attention from Mercedes to her. During a Christmas vacation, Laura was beaten twice by Manuel because she refused his sexual advances and his attempts to dissuade her from becoming a nun. She was forced to flee the house to avoid him. Manuel stopped paying for Laura’s education, but she held to her desire to become a nun. When the nuns at her school learned of the situation, they gave her a scholarship. With a grateful heart, Laura returned to school, but she was still deeply concerned about her mother. Laura’s offer was accepted. In late 1903 Laura became seriously ill with pulmonary tuberculosis and returned to her mother. On Jan. 14, 1904, Laura refused the sexual advances of the drunken Manuel, who beat her unconscious. Though she recovered consciousness, Laura never recovered her health. On Jan. 22, 1904, Laura died from a combination of the disease and the abuse. Mercedes left Manuel and returned to the Catholic Church. On Sept. 3, 1988, Laura Vicu¤a was beatified by Pope John Paul II.